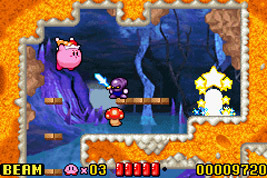 A remake of the NES game, Kirby's Adventure. When the people of Dream Land stop dreaming, Kirby finds King Dedede bathing in the Fountain of Dreams. The greedy king broke apart the Star Rod that powers the fountain and gave the pieces to his friends. 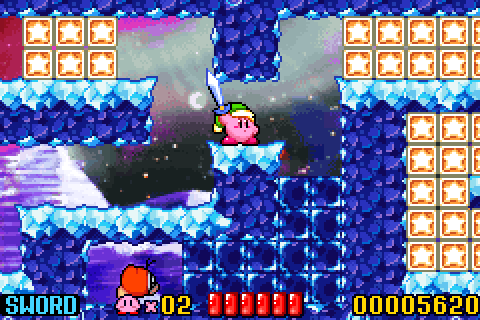 Kirby sets out to gather the pieces and restore the Star Rod. This version features improved graphics and sound, plus several new minigames and features, including Meta Knightmare mode where you can play through the entire game as Meta Knight. 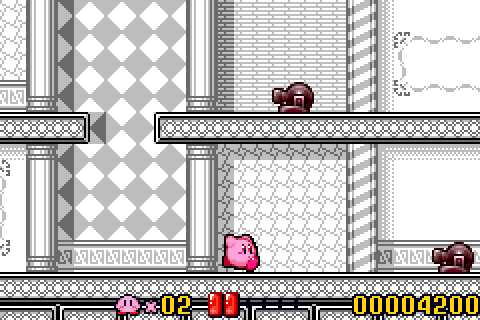 As in the NES version, stage 7-6 is a black and white stage based on Kirby's Dream Land. 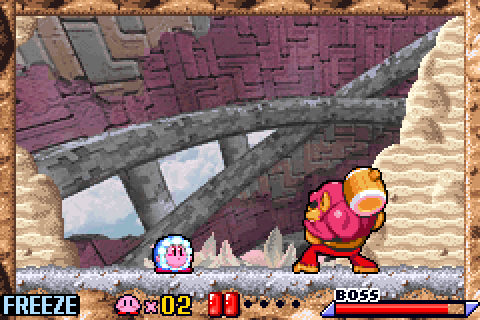 It is notable than in this game the stage sprites are a direct lift of the Kirby's Dream Land sprites, unlike in Kirby's Adventure. When Kirby gets the Freeze ability he dons a blue winter parka, which he first wore in Super Smash Bros. Melee after inhaling Popo the Ice Climber. When Kirby gets the Sword ability he wears a pointy green hat and a blue-hilted sword, based on Link from The Legend of Zelda series.